More flooding is expected in some areas. 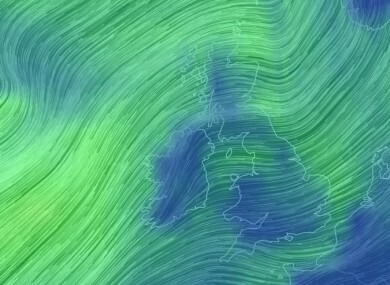 The wind picture off Ireland last night. TWO FRESH WEATHER warnings have just come into effect – and further spells of heavy rain are expected in the coming days. People in the areas worst affected by the weekend’s Storm Desmond are being told there may be further flooding later this week. Councils in Clare and Limerick said yesterday that floodwaters were likely to increase – but other areas are also vulnerable. Authorities say they’re most concerned about areas around the River Shannon. The Irish Red Cross is setting up emergency drinking water distribution points in three areas worst hit. South to southwest winds will reach mean speeds greater than 45 km/h and up to 65 km/h, with gusts up to 100 km/h possible. 20-35 mm of additional rain expected. The wind warning will be in effect until 11pm. The rainfall warning lasts until midnight. More heavy showers are expected in some areas on Thursday – and it will turn colder towards the end of the week with some wintry showers. Rain will spread across the country from Munster on Saturday – and there’ll be even MORE rain on Sunday, spreading in from the West. A Met Éireann meteorologist said last night that there was no sign of any let-up to the pattern of heavy showers and bands of rain, as their forecasting models only cover up to 10 days. There will be some good drying days but some further spells of rain moving in from the Atlantic as well. Now within that period there’s no evidence of any major rainfall event but there will be spells of heavy rain over the next 36 hours. Email “Two weather warnings just kicked in - and forecasters say there's no end in sight”. Feedback on “Two weather warnings just kicked in - and forecasters say there's no end in sight”.